Over the last six months, Carrington Elliot and I have been creating and praying over the idea of a one-night creative conference for women in College Station. I began to pray and seek and dream and doubt and obey through this dream of mine. Over the last year, older women in my life have been instilling in me the idea that being a creative is okay. This realization allowed me to walk in walk freely in my creativity. I already knew that I loved to cultivate words and share stories through photographs and memories, but I realized I had developed a passion to truly capture life through words that would leap off of pages paired with photographs that would speak so much louder than my words. After time of praying on my hands and knees, the Lord gave me the green light to create. I began to think of a team that could make this dream a reality. Adison Haager and Madeleine Inglish have the talents and gifts of creating beautiful things on social media. Allison Riffe has a mind that is strategic and organized to create a purposeful passion. Lo Moss has a servants heart that loves to network and connect her worlds. And Carrington Elliot is a dreamer and doer that rallies well around her people. This team has come together in prayer and time to launch this movement. This conference would consist of 45 women that either are on the fence of pursuing creativity, established women in creativity, or eager women that just want to experience the culture. Our hope is to cover every creative avenue. From flowers, to blogging, to photography, to calligraphy, and everything in between, we want to create a moment that College Station has never experienced. This town is a vacuum of creativity, and it is in need of empowering individuals to drive to forward. 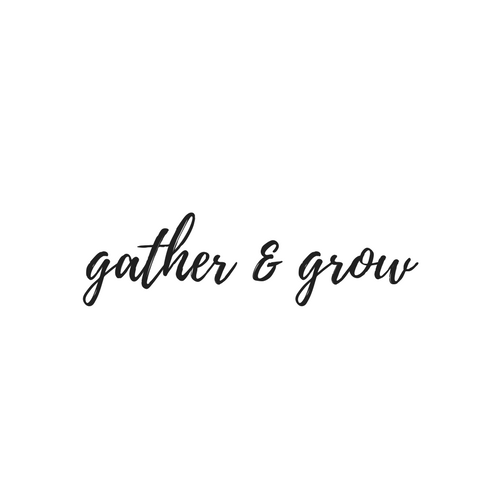 With an incredible amount of thought and prayer, we came up with the name Gather & Grow. Here, we will empower and cultivate women to do holy and creative things. Our goal is to not only to do these things, but to do this work in a community of women brought together by testimonies and authenticity. Gather and Grow will be used to empower and cultivate individuals. To equip them to do holy and vibrant things, molding together a community of creators. We will seek to use passion for purpose. To let our talents only bring Him glory and to celebrate in humility. This is where you come into play. I have spent time and prayer in thinking of the topics that would benefit the group of women that would come gather together and who would speak. This night will be a time to come and gather around the table. To meet new friends and cultivate a community. Our three speakers have a heart for networking and storytelling. These women have personally impacted me in my creative journey. These three have a story to be heard that I am thrilled for you all to hear. Over the next few weeks, we will introduce my friends that will bring great wisdom to us all. So friends, bring your girlfriends and grab a seat at the table.